I too don’t know the reason but I think it is because of its cheap cost and huge supply. But whatever one may say this banking crypto has maintained its #2 position on CMC for an almost a year now and I know it’s very ironic that banking crypto has done so. Ironic because cryptocurrencies like Bitcoin or Litecoin came as an alternative to traditional banking. But let me stop here and save that discussion for sometime else. Coming back to the original topic of today where I am going to share a comprehensive list of best wallets for storing Ripple coin (XRP). Developed by a France based start-up, Ledger Nano S is the one of the world’s most popular hardware wallet to safely store your cryptocurrencies. It is a multi-currency HD wallet that supports more than 700 cryptocurrencies and tokens including Ripple coin. So if you are a holder of XRP coin this is the best XRP coin wallet you can get right now. It is a small flash drive like device that comes with an OLED screen which helps in transaction authorization on the device. Plus you get the Ledger Live app to control and manage your funds on the desktop but you need not worry as your private keys are always on the device. When you setup Ledger Nano for the first time you will get your 12 to 24-words long seed which is very important to keep your funds safely. If you lose this seed words now one can help you retrieve any of your funds from the Ledger Nano S. So if you have a significant amount of Ripple cryptocurrency, you should no think twice in getting yourself a Ledger Nano S device. Ledger Nano S is now available in 6 colors and it will cost you around $100 to safeguard your hundreds of cryptocurrencies on it. CoolWallet S is also a multi-currency hardware wallet designed specifically for a modern world. It is a small credit/debit card like device with a small digital screen on it. You can use this wallet in conjunction with your iOS or Android mobile wallets and still be assured of the security of your funds. You can also use this wallet with Bluetooth/WiFi/NFC and can store Bitcoin, Ethereum, Litecoin, XRP, Bitcoin Cash, and ERC20 Tokens on it. And like the Ledger Nano S wallet, when you set up your CoolWallet S you will get your 12, 18, 24- words long seed that you need to safeguard always to be in control of your funds. Toast wallet is another reliable name that you need to take while talking about XRP wallets. Toast wallet provides both mobile and desktop wallets for various types of users to store their Ripple cryptocurrency. Also, it a free to use open source XRP Wallet for iOS, Android, Windows, Mac, and Linux. And the developers believe that they have created a cross-platform XRP wallet that’s simple enough for your grandma but safe enough for a Swiss banker. Moreover, control your funds here and no secret or private key ever leave out of your device because everything is designed in a non-custodial way. Lastly, it is a Ripple-only wallet that which shows the developers are razor focused on developing their product for one cryptocurrency i.e XRP. Looking for something even simpler than Toast wallet? Well, we have got your back here. Edge wallet is a popular multi-currency wallet that has been here since 2014 and is developed by experienced developers of Aitbitz wallet. Airbitz is another reliable Bitcoin wallet but its successor is Edge wallet with an improved UI and security. With Edge, you need not even save your seed as you can just get started by setting up a strong username and password which always remain encrypted on your device. Edge crypto wallet currently supports BTC, BCH, LTC, QTUM, DASH, XRP etc. Another recommendation from our end while using Edge wallet is to use their Biometric TouchID and FaceID login for an enhanced level of security. Edge wallet is available for both iOS and Android devices. Ethos wallet is one my favorite mobile wallets and if you have multiple currencies then this one of the best wallets to use. It is also well known as the world’s most advanced universal wallet to store 100+ cryptocurrencies & ERC20 tokens including Ripple. Moreover, with Ethos SmartKey, you get the best security of a non-custodial wallet and its UI is just too good to understand by yourself. SmartKeys are bit different from the private keys but gives you full control of your wallet and is much like the seed. With Ethos wallet, you can use the WatchFolio feature that helps you keep a watch on many other cryptocurrencies that you have saved elsewhere. Ethos wallet is available for both iOS and Android devices. Another free to use Mobile wallet for XRP is Abra wallet. Abra wallet is a multi-currency HD wallet where you can store and manage more than 10 cryptocurrencies including Ripple. 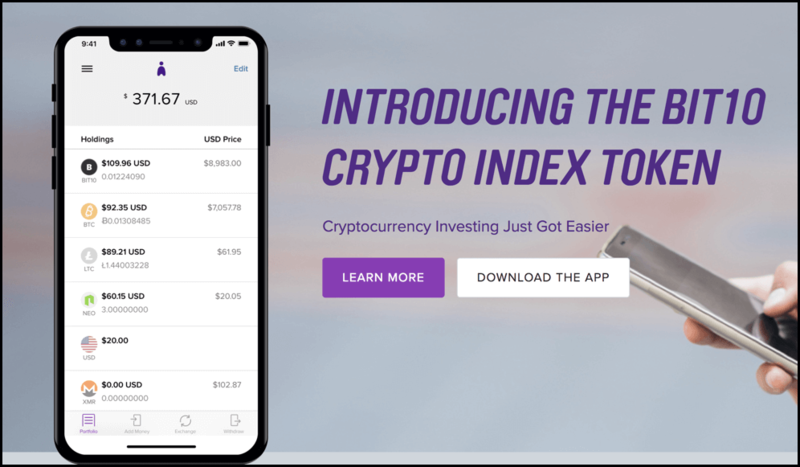 Plus using the Abra app you can invest in 28 cryptocurrencies as they have their inbuilt exchange and still control your funds because it is a non-custodial wallet. Being a non-custodial wallet you get access to your unique recovery phrase/seed and thus you always control your funds. Abra wallet is available as of now for both iOS and Android devices. Still not satisfied and looking out for more variety of XRP wallets? Well, I must say then you must have a look at Guarda wallet. Guarda wallet is developed by an experienced team and is relatively is a new entrant for XRP wallets. 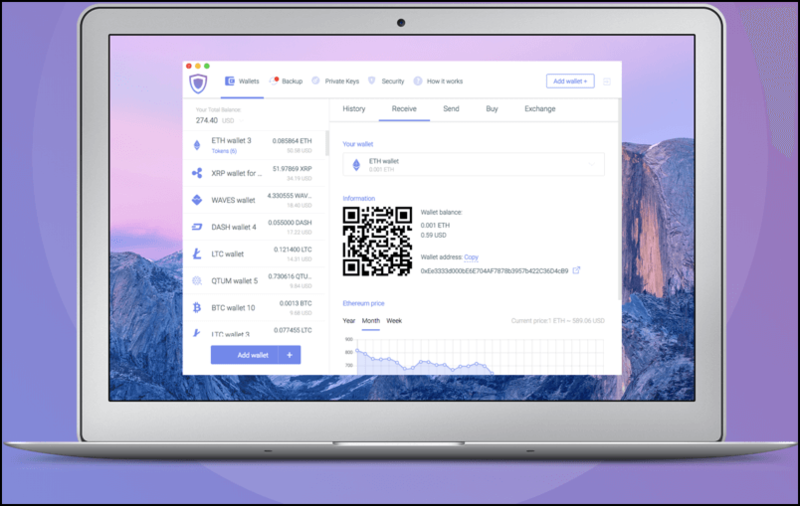 It is a lightweight wallet where you don’t need to download the whole blockchain for using the desktop wallet. You also remain in 100% control of your funds as Guarda has no access to your private keys or seed. You can receive, send, store, buy and exchange cryptocurrencies in complete anonymity and safety. I have used this wallet once for other cryptocurrencies but using XRP is almost the same and I must say it is quite easy to navigate in the desktop wallet for which Linux, Windows or MacOS versions are available. Guarda has its web wallet also where you can manage your XRP funds in a non-custodial way but we still recommend you to opt for the desktop version to avoid getting phished. Exarpy wallet is for those who want another reliable web wallet for XRP. It is a non-custodial, fast, and secure way to handle your XRP funds but remember that this is a warm-wallet so you should not hold a significant amount of Ripple in it. Exarpy is not a free wallet and it charges a flat service fee of 0.025 XRP per transaction (for transferring and importing). This fee includes the Ripple network transaction cost. Lastly, you can make as many XRP wallets you want because there is no fee for making those wallets. (20 XRP deposit is a must though). Also, this is purely web version, so you can access your wallet from any browser or any device very easily. I know some of you might not like the headache of holding your private keys or seed. Cryptonator is free to use hot-wallet or I should rather say non-custodial wallet where you don’t control your keys or seed. However, it doesn’t mean that you should just ignore this wallet because there are other 2-FA authentications in place to give you security. With Cryptonator you can hold more than 10 cryptocurrencies including Ripple and you can exchange Ripple for other cryptocurrencies in the app itself. Cryptonator has an Android app as well as a web version of its platform available for you. Wirex is another custodial wallet solution to hold your XRP coins. Using Wirex mobile and web apps one can securely store, receive, and send four cryptocurrencies (Bitcoin, Litecoin, Ethereum, XRP). But here you don’t control your seed or private keys but you 3-D Secure protection for all online transactions from unauthenticated payments. It is also one of the very few UK based crypto-fiance company regulated by the financial authority of Europe and it gives your crypto-cash-backs also when you spend from their app. You also get their iOS and Android mobile apps for using Wirex platform which is currently available in 5 languages-English, Spanish, French, Japanese and Russian. Well, then you can use Ripple paper wallets but paper wallets need a lot more caution from the users’ end because it is just a piece of paper with private keys on it. Anyone with this paper wallet can take away your funds instantly but if you keep paper wallets safely, it is a good & cheap way to store your ripple coins. But hardware wallets are superior to paper wallets. Of course, hardware wallets come with a cost but they are worth having to enhance your security as they are a reliable cold storage for your cryptos. Ripple has a much-matured infrastructure than other cryptocurrencies and for some unknown reason, it has garnered interest from investors. And because of that there are many free and paid Ripple wallets where you can store your Ripple coins. Last but not least I have made this list of Ripple wallets after an extensive research of suggested Ripple wallets on Reddit. So feel free to use and download these Ripple wallets anytime.